Links in Purple are bookmarks and stay on-page. Links in Green are off-page and open in new windows. some are to internet databases, and some are to books that are readable on the internet. Most are not the property of this author and may change without notice. This author would appreciate being informed if anyone encounters a link that no longer works. True it is that some Lynns and Linns in Ulster are genetic Irish and derive their name from the Gaelic O'Floinn or its anglicized form, O'Flynn. In pronouncing O'Floinn, the letter "F" is faintly aspirated, rendering it nearly silent. Thus, it was only natural that the "F" should eventually be dropped in many cases. As time progressed, some O'Lynns eventually also dropped the "O". However, by no means are all Lynns or Linns in Ulster truly Irish. To the contrary, very many (perhaps a majority) either were themselves, or are descended from, Scots who migrated to Ulster shortly before, during, or after the Plantation. That truth is evidenced not only by traditional historical and genealogical research but also by Y-DNA testing of living male Lynns. In the Lynn/Lyne/Linn/Lind surname project at FamilyTreeDNA, five Lynns whose immigrant ancestors came to America from Ireland are of the Y-DNA haplogroup R-U198. In the British Isles, R-U198 is found most often in the Scottish Lowlands and England and is distinctly lacking in populations with Gaelic origins. It is also absent from Scandinavian DNA projects. Nevertheless, the focus of this discussion is the historical record, which is more than sufficient to stand on its own. This account is chronological and begins with a Scottish Lynn who obtained land and position in northwest Ulster during the plantation, beginning in 1604/05. Since he held properties forming something of a triangle encompassing portions of Counties Londonderry, Donegal, and Tyrone, those three counties are treated together in the chronologies below. Counties Fermanagh and Monaghan also are presented under a single heading, owing to a certain known family connection. The place names Derry City and City of Londonderry are synonymous. However, while the old city was originally named Derry and was renamed Londonderry with the Ulster Plantation, there never was a County Derry. Rather, County Londonderry was so named at its 1613 inception, when created from the now defunct County Coleraine and part of County Donegal. Lynns who can be identified as Scottish, Protestant, or both are found in eight of the nine counties of Ulster prior to 1850. County Cavan is the exception. In the eight counties, the earliest that such Lynns are found is 1604/05 in Londonderry and Tyrone; 1618/19 in Donegal; 1633 in Down; 1658 in Antrim; 1740 in Armagh; 1774/75 in Fermanagh; and 1777 in Monaghan. The great majority of such Lynns, as far as they have been found, lived in Londonderry, Donegal, Tyrone, and Antrim. Given, however, the very great loss of early Irish records, it should not be assumed that there were few or no such Lynns in times or places other than those found. In any event, the eight Ulster counties where Scottish and/or Protestant Lynns are found to have lived prior to 1850 are presented here in the order of earliest record discovered. The exceptions are those counties which are grouped with other counties having earlier dates. While attempting to make a judgment concerning the number of Scottish and/or Protestant Lynns living in Ulster prior to 1850, one must keep in mind the 1922 bombing of the Four Courts building in Dublin. The explosion and resulting fire destroyed nearly all the records housed there at the time. The reason information from any of those records exists is that Tenison Groves, a genealogist and antiquarian, worked in Dublin's Public Records Office prior to 1922 and transcribed some of the documents housed there before the bombing. Those portions of the relevant records from which information does exist today are described on the page Available Record. Names are spelled herein as found in the records cited. For place names that were written differently from their modern forms, the currently accepted spellings are included in brackets. Concerning the dates of records prior to the mid 17th century, there may be a discrepancy of one year in this chronology resulting from two facts. First, the Gregorian calendar was introduced in parts of Europe in 1582 but replaced the Julian calendar only gradually, particularly in Ireland, with some overlap in use. Second, some sources used for this research reported dates exactly as they appeared in the original documents while other sources converted all Julian dates to Gregorian. No effort has been made here to reconcile the two since the primary goal of this article is to demonstrate the presence of Scottish Lynns in Ulster, which is not altered by a difference of one year. 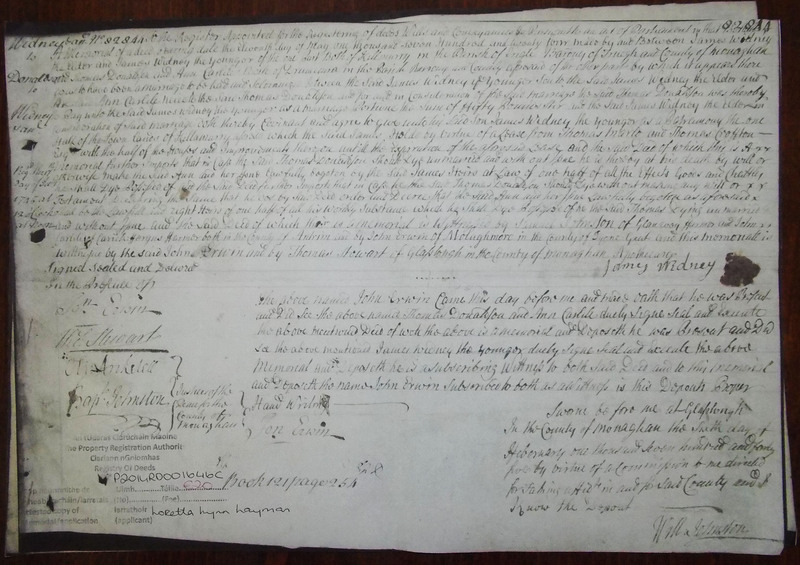 As evidenced by a deed produced in 1775 to James Hamilton, Eighth Earl of Abercorn, William Lynne of Londonderry was conveyed the County Tyrone property of Cloghogle by James Hamilton, First Earl of Abercorn on "27 October in the 38th year of reign by James". James I and VI (the sixth King James of Scotland, who became the first King James of England and Ireland) reigned from 1567 to 1625, which places the Cloghogle deed in 1604 or 1605.
http://www.proni.gov.uk/index/search_the_archives/ecatalogue.htm : Click "Search the eCatalogue", enter T2541/IA/2/1/47 in the "PRONI Ref" box, and click "Search". The Hamiltons of course were very Scottish, Abercorn being the name of their barony in Scotland. Several years after the Cloghogle conveyance, William Lynne of Londonderry also is proven to be a Scot. In his grant of denizenship on 9 July 1616, he was described as a Scottish settler of Derry City. In Nicholas Pynnar's 1618-19 survey of the Ulster Plantation, William is shown to also hold the County Donegal lands of Caroreagh and Laugaurack [Carrowreagh and Lurganbrack]. About 1625, then, William Lynne, gentleman of Londonderry, died leaving a prerogative will, which was recorded that year. Notably, prerogative wills are those in which the testator died possessed of land in more than one county. Rev. Hill unfortunately erred in his notes to Pynnar's Survey by saying that William died in 1633, possibly having assumed that a subsequent inquisition (see 1635, below) would have to have been held within a relatively short time after one's death. For a more complete account of William's life and position in northwest Ulster and a discussion of his probable connections in Scotland, see : Lynns of Londonderry, Donegal, and Tyrone. To see where his lands were situated : Map. On 17 August of this year, David Lynn and John Lynn were two of the six Scottish settlers in the Earl of Abercorn's County Tyrone manor of Dunnalong who were granted denizenship. Notably, William Lynne of Londonderry was the Earl's agent for Dunnalong. ‘Men and Arms’ The Ulster Scots, c. 1630, Edit. R. J. Hunter, Ulster Historical Foundation, Belfast (2012) (ff. 39, 43, 76v, 90v, 111, 135, 138v, 139v, 172, 198) - see also : Available Record. Andrew Linne gave a sworn deposition before Scotland's Privy Council in 1646 concerning the 1641-42 Irish massacres. He stated therein that he had been in Ulster for about eighteen years at the time of the massacres ~ thus, since about 1625. Notably, the above Andrew is the only Andrew Lynn, with any variation of the surname, in the entire 1630s muster roll; and he carried a snaphance, which was popular among wealthier Scots who carried them to Ireland. William Lynn was named as a nephew and the heir of the late William Lynne of Londonderry in an inquisition concerning Lynne's land in Largavracke [Lurganbrack], Donegal. Like his uncle, William Lynn of course was also an Ulster Scot. Ensign David Lynne, John Lynn, two William Lynns, and Major Nicholas Lynne were members of the Laggan Army, which was organized chiefly from the Ulster counties of Londonderry, Donegal, Tyrone, and Fermanagh to defend settlers against Irish forces. William Lyne and David Lyne were named in the 1654 civil survey of County Donegal as Scots Protestant proprietors of Bunintyne [Bunnaton], Largebreake [Lurganbrack], and Carrowreagh. As noted in 1604-25 above, Lurganbrack and Carrowreagh were first held by William Lynne, gentleman of Londonderry. David appears in Lurganbrack again in the 1663 hearth money roll for County Donegal. Henry Lyn was a merchant from Irvine in Ayrshire, Scotland who appears in Ulster this year, as described in a sasine (deed) registered in Ayrshire. The sasine index published in 1939 by the Scotland Record Office describes Henry as "merchant in Temple Patrick, County Donegal, Ireland", while the sasine extract in the National Records of Scotland database describes him as "merchant in Tempillpark, County Antrim". That database also includes an extract of a precept which predates the sasine by eleven days and gives investment in certain Ayrshire lands to "Susilie Oqueyne in Brendrewis in the County of Duningall [Donegal] in Ireland, spouse of Lachlan McGolrik, the sister daughter of Hugh Lin, then deceased as heir of her said uncle". The sasine as extracted is more specifically described as being "in favour of Susillie Oqueyne in favour of Henry Lyn, merchant in Tempillpark [etc.]". Clearly, Henry Lyn, Hugh Lin, and Susilie all were related. The discrepancy in Henry's location may be the result of confusion on the part of the person who created the sasine index. Perhaps he or she merely assumed Henry was in County Donegal since the sasine places Susilie there in the same sentence where it names Henry. Further, since several authoritative Irish place name databases, as well as inquiries elsewhere, have all failed to identify any place in Donegal called Temple Patrick or some variant thereof, and since it hardly seems reasonable that a Scottish merchant would have settled in a place so obscure that it cannot now be identified, it seems more likely that Henry was in Temple Patrick, County Antrim. However, since that likelihood cannot be absolutely proven, he is listed in this chronology for both counties. Research of the original register of sasines may answer the question of Henry's whereabouts. The crucial point, however, is that a Scottish merchant of the Lynn family left Scotland for Ulster sometime in or before 1658. William Lynn, gent[leman] and David Lynne, yeoman were listed in the 1660 and 1662 poll books for Donagheady Parish, County Tyrone as being in Cloghogall [Cloghogle]. Cloghogle of course was previously held by the Ulster Scot William Lynne of Londonderry, now deceased. William Lynn appears in Cloghogle again in the 1664 and 1666 hearth money rolls. In 1667, William Lynn was among nineteen Presbyterians in Donagheady Parish excommunicated by the Bishop of Derry for not adhering to the Anglican Church. William Lynne, gentleman in Cloghagall [Cloghogle] died about 1672, his prerogative will being recorded that year. William Lyn in the parish of Raphro [Raphoe], county of Donnygall [Donegal] was the only son and heir of the deceased Margaret Muir and, as such, disposed of a tenement in the burgh of Irvine, Ayrshire, Scotland which Margaret had inherited in 1604 from her father, the deceased John Mure, a notary and burgess of Irvine. Notably, Hugh Lynn, merchant was also a burgess of Irvine in 1604. It seems likely, therefore, that William was the son of Hugh Lynn and Margaret Muir. "my kinsman Moses Lynn near Strabane in Ireland"
"my sister [Margaret] Lewis & my Nephews Thomas Lewis, Andrew Lewis, William Lewis & Charles Lewis ... all of Augusta Co. [Virginia]"
Dr. Lynn's sister Margaret had married John Lewis, who became one of the founders of Staunton, Virginia; and three of their sons named above became prominent in the American Revolution. Both the Lewis and Stuart relatives of Dr. Lynn had settled in Beverly Manor, Augusta County in 1738 and 1749, respectively. However, the facts most relevant to the question of the Lynns' origins are these ... The Manor's four churches all were Presbyterian, were established between 1740 and 1746, and were then called meeting houses. The map linked below shows not only the locations of the meeting houses but also the names of men ~ Lewis and Stuart among them ~ who were ordered to survey roads. "the children of my Brother Charles in Ireland [including] his eldest son, William Lynn"
"the Daughter of my Brother Audley Lynn, Dec'd, named Ann, now living in London with her Mother"
Incidentally, the patent list linked below includes not only John Lewis but also John Lynn, Sr., an assumed or supposed brother of Dr. William Lynn whom William sued in the Augusta County court in 1751 and chose not to name in his will. Margaret Stuart's second husband does not appear on the patent list but was David Stewart or Stuart, whose 1767 will makes a certain bequest "to wife Margaret, and to her oldest daughter, Mary Pall [Paul]". At the General Synod of Ulster on 6 June 1705, Convoy Presbytery was appointed to place Charles Linn and several other men on trial for licenses to preach. On 25 February 1707, as reported at the 1 June 1708 General Synod, Charles Lynn was ordained by Convoy Presbytery at Clandy-Vadock [Clondavaddog]. At the General Synods on 1 June 1709 and 21 June 1710, Charles Lynn was one of several ministers representing Convoy Presbytery. At the latter Synod, he was appointed to a committee to revise the Synod's "Belfast Book". Convoy is in the east of County Donegal not far from County Tyrone, and Clondavaddog is in the north of Donegal. On 1 June, John Lyn was an elder representing Derry Presbytery at the General Synod of Ulster. Adam Lynn or Lynd was an elder representing Tyrone Presbytery at the General Synod of Ulster. http://www.proni.gov.uk/index/search_the_archives/proninames.htm : Click "Search for Names", enter Linn for "Surname" on the next page, deselect all but "1766 Religious Census", and click "Search". Repeat for Lynn. See also : Available Record. In each of these years, Adam Lynn was an elder representing Tyrone Presbytery at General Synods of Ulster. Records of the General Synod of Ulster, from 1691 To 1820, Vol. III (1779-1820), General Assembly of the Presbyterian Church in Ireland, Belfast (1898) (pp. 362, 388) - Note: Volume III is not currently available online. On 27 June, James Lynn was an elder representing the Colerain congregation of the Route Presbytery at the General Synod of Ulster. Coleraine is in eastern County Londonderry. Prior to 1850, only one Lynn is found in surviving records of County Down who is proven to be an Ulster Scot. Such case undoubtedly is owing in no small part to the great loss of Irish records. John Lyne appeared on the muster roll for County Down with a snaphance, an innovative and expensive firearm brought to Ulster about this time from Scotland. John Lyne was under the jurisdiction of the Episcopal Bishop of Dromore, who had authority over the town of Dunmore and the Lower Iveagh, as well of course as his own land in the county. Lower Iveagh is roughly the northern half of the barony of Iveagh, the barony lying in central County Down and stretching from the northern boundary of the county to nearly the southern tip. Henry Lyn was a merchant from Irvine in Ayrshire, Scotland who appears in Ulster this year, as described in a sasine (deed) registered in Ayrshire. The sasine extract currently in the National Records of Scotland database describes Henry specifically as "merchant in Tempillpark, County Antrim", while the sasine index published in 1939 by the Scotland Record Office describes him as "merchant in Temple Patrick, County Donegal, Ireland". That database also includes the extract of a precept which predates the sasine by eleven days and gives investment in certain Ayrshire lands to "Susilie Oqueyne in Brendrewis in the County of Duningall [Donegal] in Ireland, spouse of Lachlan McGolrik, the sister daughter of Hugh Lin, then deceased as heir of her said uncle". The sasine as extracted is more specifically described as being "in favour of Susillie Oqueyne in favour of Henry Lyn, merchant in Tempillpark in the County of Antrim in Ireland". Clearly, Henry Lyn, Hugh Lin, and Susilie all were related. Further, since several authoritative Irish place name databases, as well as inquiries elsewhere, have all failed to identify any place in Donegal called Temple Patrick or some variant thereof, and since it hardly seems reasonable that a Scottish merchant would have settled in a place so obscure that it cannot now be identified, it seems more likely that Henry was in Templepatrick, County Antrim. However, that likelihood cannot be absolutely proven, and Henry therefore is listed on this page for both counties. On 16 October, Hugh Linn and Elizabeth Geddis were married in the First Antrim Presbyterian Church in the town of Antrim. Antrim town is less than five miles west of Templepatrick. On 20 June, Hugh Lynn was an elder representing Templepatrick Presbytery of County Antrim at the General Synod of Ulster. As listed in extracts at the website of the PRONI, twelve Linns representing five parishes were Protestant householders this year in County Antrim : Adam, two Hughs, James, and Samuel in Drummual Parish; Charles in Dunekeghan Parish; Hugh and John in Clogh Parish; Hugh, James, and William in Loghall Parish; Widow Linn in Rasharkin Parish. Again, of course, only part of this census had been transcribed before the 1922 bombing that destroyed the original. http://www.proni.gov.uk/index/search_the_archives/proninames.htm : Click "Search for Names", enter Linn for "Surname" on the next page, deselect all but "1740 Protestant Householders", and click "Search". See also : Available Record. Robert Lynn was born about 1744; became a merchant in Belfast, County Antrim; and died in 1824 at age eighty. He very probably is the same person as the Robert Linn who in Belfast signed the 1775 petition of Protestant Dissenters seeking an end to religious discrimination. http://www.proni.gov.uk/index/search_the_archives/proninames.htm : Click "Search for Names", enter Linn for "Surname" on the next page, deselect all but "1775 Dissenters Petitions", and click "Search". Michael Linn or Lynn was born about 1755; and died in 1784 at age twenty-nine. He too signed the 1775 petition of Protestant Dissenters in Belfast. According to his death notice, Mr. Henry Lynn of Broadisland [Templecorran Parish], County Antrim was born about 1761 and spent almost thirty years as a ruling Elder of the Presbyterian Congregation in Ballycarry. The notice states also that he had died on 28 November 1833 at age 71. Since Ballycarry also is in Templecorran Parish, Henry ~ if not born in the parish ~ must have lived there at least as early 1803. John Linn of Drumgooland Parish, County Down was a Dissenter who signed the 1775 petition of Ulster Protestants. http://www.proni.gov.uk/index/search_the_archives/proninames.htm : Click "Search for Names", enter Linn for "Surname" on the next page, deselect all but "1775 Dissenters Petitions", and click "Search". See also : Available Record. As memorialized by a granddaughter who was eleven when the family left Ireland, James Lynn was a Scottish Presbyterian who was born in County Londonderry and moved to the now defunct village of Knockahollet [Loughguile Parish], County Antrim, where he raised six sons and two daughters before emigrating to America circa 1850. The family settled in Exeter, Green County, Wisconsin. James’s gravestone states that he was born in County Derry [Londonderry] and died on 19 March 1858 at the age of 78, indicating birth in about 1780. On 29 June, Hugh Lynn was an elder representing the Ballymena Presbytery at the General Synod of Ulster. Hugh Linn was born in 1753 to a Scottish Presbyterian family, possibly in County Monaghan. In 1777, he did marry a County Monaghan woman whose family were also Scottish Presbyterians. In 1713, Sarah's great-grandfather, James Widney, was one of four Commissioners who petitioned the Presbyterian Church in Ireland for the establishment of a new, separate congregation for certain members of the congregation of Kinaird [Kinard], Presbytery of Monaghan. The request was granted, and the new congregation was situated in the village of Glaslough, which lies in the northern tip of County Monaghan. About four miles northwest of Glaslough is the townland of Killymurry, half of which the Widneys owned from at least 1724 until the year 1784. In the latter year, the eldest son ~ Sarah's brother James ~ sold the property and left for America. In 1788, Hugh, Sarah, and three of their children followed James to Pennsylvania. Hugh's Scots Presbyterian origins and certain other details mentioned above are attested to in a biography derived in large measure from the knowledge of his son Hugh Linn II, who married another member of the Widney family. A History of a Fragment of the Clan Linn, Dr. George Wilds Linn, Chambersburg, PA (1905) (pp. 11, 27, 68, 93, 95) at https://openlibrary.org/ - Note : Although Scottish, the Linns were never a clan but were merely assumed such by Dr. Linn. William Lynn was born in 1774 or 1775; lived for some period in Clontivrin, County Fermanagh; died in 1847 at the age of 72; and was buried in Clones Parish, County Monaghan. The register of Clones Parish, Church of Ireland (a Protestant denomination), describes him as "of Clontivern [Clontivrin]". Now uninhabited, Clontivrin was described by Sir Humphrey Davy in the 1876 Journal of the Royal and Historical and Archaeological Association of Ireland (Vol. III) as being situated one mile west of the town of Clones. William Lynn's son William married Anne Sheridan and lived sometimes in Monaghan and sometimes in Fermanagh. Between 1825 and 1832 (or 1844), William and Anne had four (possibly five) children baptized in Galloon Parish, Fermanagh. Between 1835 and 1842, they had four children baptized in Clones Parish, Monaghan. William and his family lived in Parson's Green Glebe, Fermanagh circa 1825-1828 (and perhaps longer); in Mullaghgare, Fermanagh in 1832; in Mullanamoy, Monaghan circa 1835-1837; and in Clontivrin, Fermanagh circa 1840-1842 and probably until the late 1850s. The eldest son of William and Anne, also named William, emigrated to America about 1850. He was followed less than a decade later by his parents and five of his siblings. Two of the first group of children and three of the second are proven by U.S. records to be children of William Lynn and Anne Sheridan. The other children all remained in Ireland, where one additional child in the first group is proven to be a daughter of William and Anne. She, having already married, remained in Clontivrin until her death in 1896. Similarly to the case in County Down, only one Lynn is found in surviving records of County Armagh prior to 1850 who is proven to be a Protestant and/or Scot. Again, however, such case undoubtedly is owing in no small part to the great loss of Irish records. Michael Lynn in Lurgan Parish is the only Protestant householder this year listed in the existing transcripts of this census for County Armagh. http://www.proni.gov.uk/index/search_the_archives/proninames.htm : Click "Search for Names", enter Lynn for "Surname" on the next page, deselect all but "1740 Protestant Householders", and click "Search". See also Available Record. It cannot be clearer. Lynns from Scotland settled in Ulster, Ireland as early as 1604/05 and eventually made their homes in at least eight of the nine counties of that historic province. In 1654, heirs of the 1604/05 settler of Londonderry, Donegal, and Tyrone were named as Scots Protestants. In 1667, one was named specifically as a Presbyterian in Tyrone excommunicated for not adhering to the Anglican Church. By 1740, dozens of Lynns were Protestant householders spread among five or more of the nine Ulster counties. Unfortunately for Lynn historians and genealogists, transcriptions of the 1740 returns had been made for only six of the nine counties before the original returns were lost. To believe that all, or even that most, Lynns in Ulster were actually O'Flynns is to deny the authentic origins of countless Ulster Scots who bear the name.